I can honestly say this is one of the best things I’ve made in a very long time. I absolutely love ADORE tuna and I’m always excited to go back to Tokyo to have delicious tuna sashimi! I don’t normally buy tuna at the supermarket, but the other day I saw a fresh, delicious looking tuna steak so had to go and grab it! 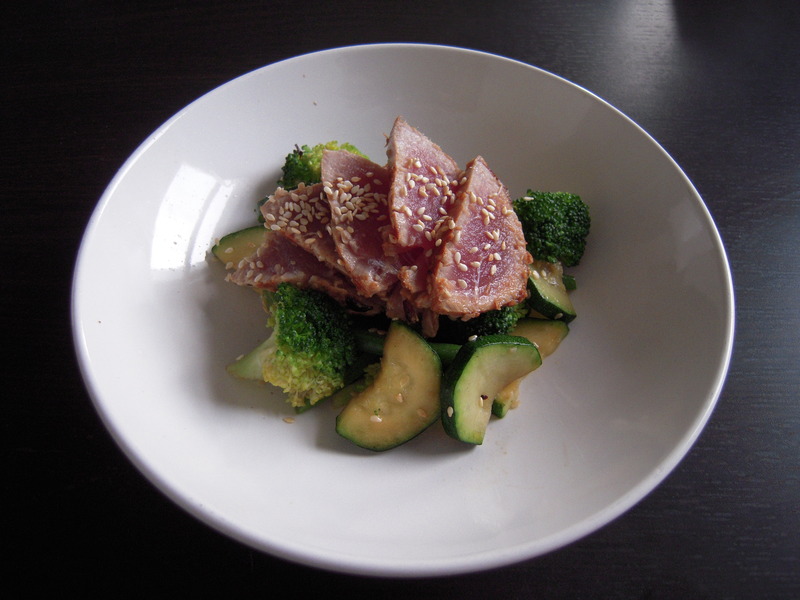 I’ve made seared tuna before but this time it was just amazing – I highly recommend marinading it before hand, it makes a world of a difference! 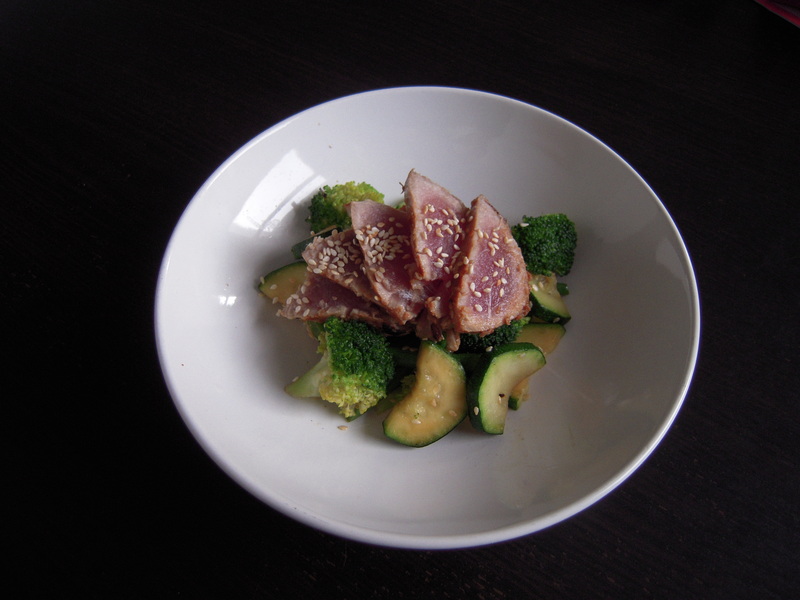 Pour ingredients into a shallow bowl and put tuna in, rubbing it into the marinade. Leave to marinade for about 30 minutes (I left mine out, not in the fridge, as I wasn’t leaving it for that long). Once marinade has sunk in, heat the pan so it’s very hot. Add tuna and sear for 1-2 minutes per side. On the final side, pour the remaining marinade over the tuna in the pan. Take it out the pan and cover with the sesame seeds and let it rest for about 2 minutes and slice. Before stir frying, steam the broccoli and green beans for a few minutes until al dente. Heat oil in a pan with the ginger and garlic until fragrant. 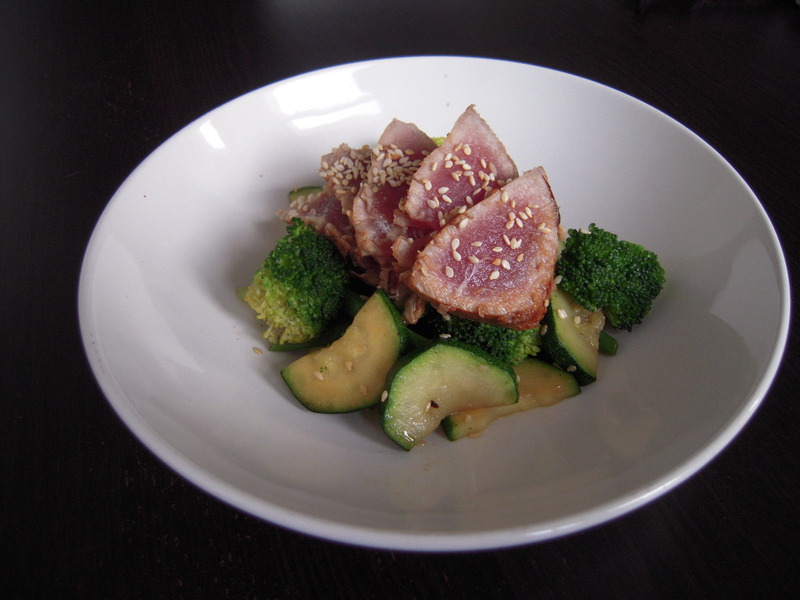 At the last 30 seconds of cooking, add sesame oil and sesame seeds.